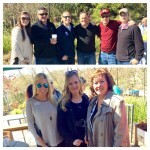 The Monson Law Firm participated in the New Orleans Claims Association’s Putt Putt Palooza, which was held at City Park. This fun event helps NOCA raise money for the Melanie Lege’ Memorial Scholarship. 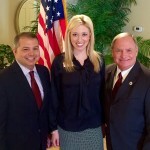 Pictured above are, Allison Salter with Guarantee Restoration Services, Josh Cockfield with Louisiana Claims Administrators, Shawn Folks with Guarantee Restoration Services , Michael Montgomery with VeriClaim, Matthew Monson Esq. and Nick Foret with Command Claims. Pictured below are Ann’Lee Earles, CPIA, Marcy Chalk and Sherry Lincoln with Americas Insurance Company. Click here to view pictures! The Monson Law Firm attended the Young Insurance Professionals of Louisiana’s 2016 Annual Winter Conference in Lafayette. This year’s conference offered 6 hours of continuing education on the following topics: “Who’s Insured on What Auto, Determining Insured Status on Commercial and Business Auto Policies and Turning Your Technical Knowledge Into Dollars.” We would like to thank everyone who stopped by our booth at the World Series Exhibit Hall, we look forward to seeing you again next year! Pictured are Matthew Monson, Esq. and Ann’Lee Earles, CPIA. The Monson Law Firm attended the Louisiana 1752 Club’s annual meeting in Lafayette. The mission statement of the 1752 Club is, “To Unite and Inspire Insurance Marketing Professionals to Excellence by Networking, Training, and Mentoring.” Congratulations to Andrew Marin for being elected to serve on the 2016 Board of Directors. 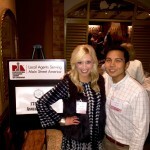 Pictured are Ann’Lee Earles, CPIA, Marketing Director of The Monson Law Firm and Andrew Marin with Americas Insurance Company. While most other law firms are hesitant to file bad faith Motions for Summary Judgment, The Monson Law Firm wins them. 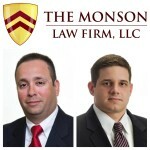 If your company is in need of defense of Bad Faith claims in Louisiana and Texas, contact The Monson Law Firm today! The Monson Law Firm attended the Baton Rouge Chapter of Professional Insurance Agents February lunch meeting at Oak Lodge. We learned from State Representatives, Chad Brown-District 60 and Rick Edmonds- District 66 of Baton Rouge. Chad and Rick spoke on the upcoming legislative session and what changes they plan to make with state budget crisis. The 2016 First Extraordinary Session starts this Sunday, February 14 at 4:00 pm. For more information on the session you can visit the Louisiana State Legislatures website at http://www.legis.la.gov/legis/Home.aspx. Pictured are Chad Brown, State Representative, District 60, Ann’Lee Earles, CPIA and Rick Edmonds, State Representative 66. Click here to view pictures! 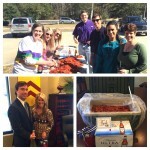 Thank you to The Williams Team for helping our counselors with a kick start the crawfish season in style. 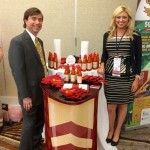 We are grateful for our relationship with Louis Williams, Whitney Hartson and the rest of The Williams Team! Click here to view pictures! 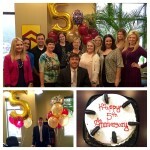 Today we celebrate our 5th anniversary. We want to thank our family, friends and clients for making this possible. We look forward to serving you for many years to come! Click here to view pictures!